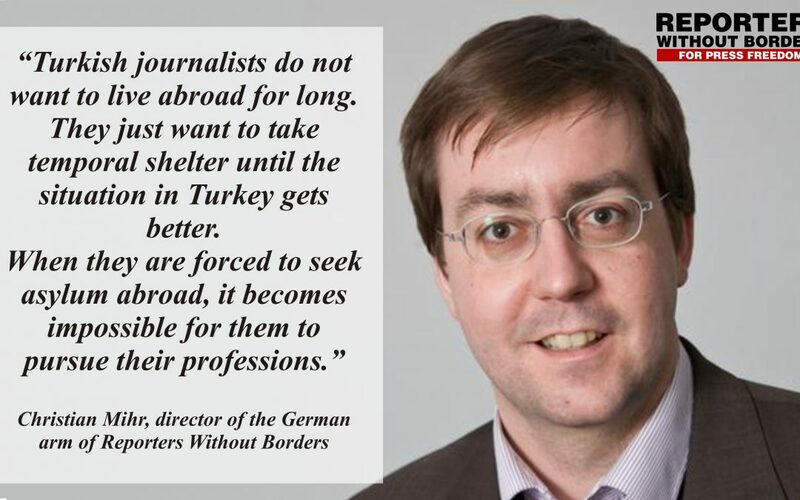 Christian Mihr, director of the German arm of Reporters Without Borders, has called on Turkish government to grant visa, resident permit to Turkish journalists who are subject to persecution at home. “Germany should immediately provide convenience for Turkish journalists in obtaining visa, resident and work permit,” Mihr told a Deutsche Welle reporter on Wednesday. “Turkish journalists do not want to live abroad for long. They just want to take temporal shelter until the situation in Turkey gets better. When they are forced to seek asylum, it becomes impossible for them to pursue their professions,” Mihr added. In a related development, Turkish President Recep Tayyip Erdogan likes the media to be “submissive and docile and sing his praises,” Reporters Without Borders said in a report published on Wednesday. The document lists 35 leaders and organizations deemed “enemies of press freedom,” as ranked by the group, which is also known by its French acronym RSF. RSF published the list on November 2, the International Day to End Impunity for Crimes Against Journalists. Following the failed coup in July, Ankara started a crackdown on the press that worsened an already grim situation in Turkey, according to the organization. Over 200 journalists have been arrested and 125 remained in prison as of early October. The government also eliminated at least 124 media outlets”by decree” the report said.